Remember last week when I made my birthday wish list (here)? Well, apparently my husband does read my blog because he surprised me with this sequin top over the weekend (along with a few other fun gifts). I love that it fits like a tee and is stretchy enough to push up the sleeves, making it incredibly versatile. 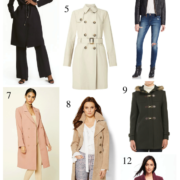 A few other combinations I’m thinking of: a cargo vest layered over with jeans & booties OR a chambray shirt underneath with slim trousers & bright pumps. you look SOOOOO pretty! sounds like your bday was a good one! good job hubby on the sequin shirt!!! That sequin top is the perfect addition to your wardrobe for the holiday season. I really like the blouse – May have to pick one up. I love everything sequins. Sidenote: your hair looks so pretty in these shots. LOVE this! Shirt is an incredible find, and props to the husband for checking out the blog. Also have seen that skirt on ON; really helpful to see it on… might be a necessary purchase! Alyson, definitely pick up the skirt – I also bought it in the bright pink color…but check in stores because I got mine on clearance for less than $10 (they aren't marked down that much online though)! This top looks so gorgeous on you and the colors-green & gold-really make your eyes stand out. I hope you had a wonderful birthday! Love the top! Your hubby did a great job. Gorgeous. Aww, it's so sweet that he visited your blog to see your wishlist. And that shirt is phenomenal on you. The color is so flattering! Love the blog! And todays outfit is perfect. An unexpected pairing of sequins and army green. My fav. Love also the idea of putting short sleeve blouses under sweaters! Happy Birthday…what else did you get? The top is beautiful and I am so glad he surprised you with it! I like how you paired it with the skirt as well as the tights! Love this outfit. That top is amazing!! !Paired well together with that skirt and black tights/shoes. you look great!!! Happy belated birthday! How thoughtful of your husband!! This really is a gorgeous sequin top and it looks great on you! Lucky girl! That shirt is so pretty…I love it with the green skirt…such a great combo! This is an absolutely beautiful top and looks fabulous with the skirt! Such a sweet hubby to get it for you 🙂 Happy belated Birthday! Ahhh! I love the last picture! If I had to wear anything this Holiday season, this outfit would be it! I love everything about it – esp. the sequin top!